The Coordinator of the Transcription Program would be pleased to receive suggestions for items to transcribe from the Library's Archival Collection, and would also be pleased to receive electronic transcripts of our archival documents which family historians and researchers may have completed. 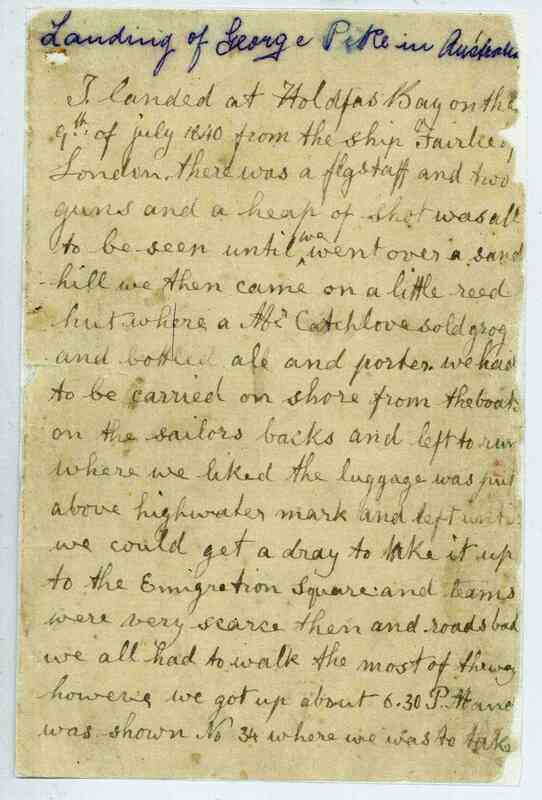 Diary of his arrival as a 13 year old at Holdfast Bay aboard the Fairlie 1840. Diary of a voyage to Adelaide, settlement and sheep farming in the Gawler Ranges, and a trip to Mattwarrangalla 1863. Journal of voyage to South Australia on the Pakenham 1848-49, and subsequent experiences in Adelaide and the Burra Burra copper mines 1849. 181 pages of letters by important trader Emanuel Solomon who arrived in South Australia in 1838, invested in land and buildings, began a business as an auctioneer and merchant, had his own vessel the Dorset trading between Adelaide and Sydney, and in 1840 erected the Queen's Theatre, the first building of any substantial size in Adelaide. He was a prominent member of Adelaide's Hebrew Congregation. Letters and a diary of a journey on the Pakenham from Plymouth to Port Adelaide 1848. Henry Watson was a pharmacist businessman, book lover and wine lover and became the founder of South Australia's first wine industry association. His diary describes his emigrating voyage with his family from England to South Australia on the Katherine Stewart Forbes including a description of a visit to a vineyard in Capetown 1838-39. 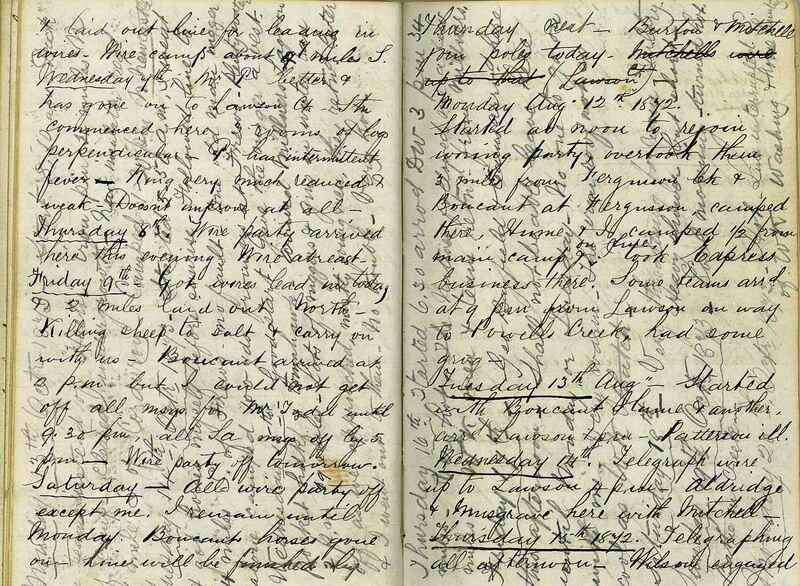 Diary by 20 year old Wilson, (who became Adelaide’s first entomologist) of a voyage to South Australia on the Duke of Roxburgh with details of steerage conditions on board, and maps and sketches of the countries passed 1838. Five volumes of reminiscences 1840-77. Volume 2 describes his trip to the Victorian goldfields in 1852. Volume 4 is written as Chief Warden on the Northern Territory goldfields 1873. There are also references to gold in volumes 1, 3 and 5. Diary of a prospector covering the Alice Springs region and northwards. Diary sketches include maps of his exploration routes and views of various places including Chambers Pillar and Ruby Gap. August-December 1888. Manuscript newspapers (volume 1, no. 1 (2 January 1869), no. 2 (9 January 1869) and no.3 (16 January 1869) associated with the Northern Territory survey expedition. Much of the content is tongue-in-cheek comment on the members of the expedition and their activities aboard the ship. Publication credits: 'Printed and published for the Proprietors at the Office abaft the main-mast ship "Moonta" every Saturday morning'. Letter from Oak Gully describing his life on a sheep station near Dry Creek 1848. 167 pages of letters by entrepreneur businessman Emanuel Solomon who arrived in South Australia in 1838, invested in land and buildings, and with his brother in Sydney operated the ship Dorset trading between Adelaide and Sydney. In 1840 he erected the Queen's Theatre, the first building of any substantial size in Adelaide. He was a prominent member of Adelaide's Hebrew Congregation. Research paper by Max Slee of 2005 on Richard and Mary Ann Day who arrived in 1838. He built huts and grew crops on the River Torrens and Walkerville; worked as a teamster at the Burra Mines; purchased land around Prospect Village, Cheltenham, Regency Park, Reeves Plains, Gawler River; Two Wells and Kangaroo Flat; built Croydon Villa; in 1880 his property at Tam O'Shanter Belt (also known as Salt Water Springs) was acquired for Islington Sewage Farm, which in 1975 became part of Regency Park including Sunnybrae Farm. He died in 1900. 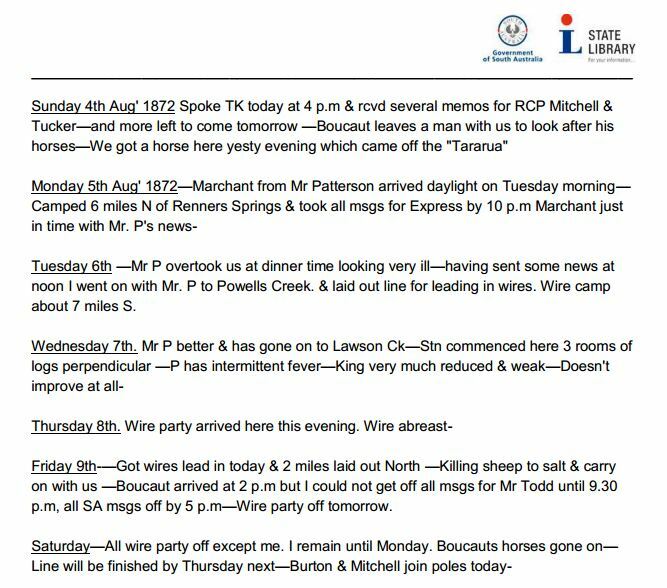 Methodist minister's diary with details of his activities in the metropolitan area such as Kensington, Mitcham, Norwood and Athelstone, and in country areas such as Strathalbyn, Kadina, Moonta, Wallaroo, Gawler, Clare and Kooringa 1856 to 1901 and letters from Burra Burra to the Briston circuit, 1856 to 1898. Note by teacher of violin and co-founder of the Adelaide College of Music (forerunner of the Elder Conservatorium) with interpolations and translation from the German by Professor and Mrs Henry Krips ca 1916. Speech given by Ellis at the annual dinner of the S.A. Commercial Travellers and Ware-housemen's Association, held at the South Australian Club Hotel on 11 September 1903. Miscellaneous letters and newspaper clippings from a collection belonging to the Gilbert Family of Pewsey Vale, the renowned pioneer South Australian sheep pastoralists and breeders 1907-1913, 1923.